The work of researchers Francesc Viñals and Mariona Graupera at the Bellvitge Biomedical Research Institute (IDIBELL, Oncobell program) – Catalan Institute of Oncology (ICO, ProCURE program) – University of Barcelona, together with Dr. Antoni Riera-Mestre (IDIBELL, Bellvitge University Hospital, University of Barcelona), has led to a new potential treatment for Hereditary Hemorrhagic Telangiectasia (HHT) or Rendu-Osler Syndrome, a rare disease that affects blood vessels and had no described treatment. The study, published in Arteriosclerosis, Thrombosis and Vascular Biology, is a clear example of translational collaboration possible thanks to the interaction between the basic and clinical research groups at Bellvitge. "Our group has been working with endothelial cells for a long time, focusing on how they are affected by changes in the TGF-beta signaling pathway from a basic research perspective", explains Dr. Francesc Viñals. The group was especially interested in a receptor for a TGF-beta factor called BMP9, the ALK1 receptor, which endothelial cells express exclusively; For years, mutations in ALK1 have been associated with HHT, a disease that causes arteriovenous malformations and unexpected bleeding. "Externally, HHT causes recurrent epistaxis (nosebleeds), which often require urgent attention; internal arteriovenous malformations can cause functional organic alterations and require interventional procedures, such as the embolization of pulmonary arteriovenous fistulas or liver transplantation." A first collaboration with the vascular signaling research group of Dr. Mariona Graupera, also at IDIBELL, allowed Dr. Viñals' team to develpop a model for the formation of blood vessels in the retina of mice that lacked the copy of the gene for the ALK1 receptor. The lack of this receptor gave rise to errors in the formation of blood vessels by excess of endothelial cells, which matched the researchers' theory: if members of the TGF-beta family usually act as a "brake" for cellular proliferation, mutations in one of its components should lead to uncontrolled proliferation. The results were replicated and confirmed in in vitro cultures. While trying to better understand this mechanism at the molecular signaling level, researchers singled out the PI3K pathway as one of the most affected. "We are lucky that Dr. Graupera's group specializes in this pathway in endothelial cells, which allowed us to start a closer collaboration immediately". This collaboration allowed them to use models where PI3K was mutated and did not work correctly. The stimulation of PI3K acts as an "accelerator" for the endothelial cell to proliferate. BMP9, (through ALK1) acts as a growth-limiting brake, as already demonstrated, and does so by suppressing the activity of PI3K. When ALK1 is mutated, there is no brake and the endothelium proliferates more thanks to the PI3K pathway. But in a model in which both PI3K and BMP9 are mutated, there is neither accelerator nor brake, and what the researchers could observe is a stabilization in the proliferation of these cells. "Following this line reasoning", explains Viñals, "we were facing a possible treatment for HHT: if we could genetically achieve cell growth normalization, why not try to pharmacologically inhibit PI3K to make up for the mutation of BMP9 and achieve the same result?" 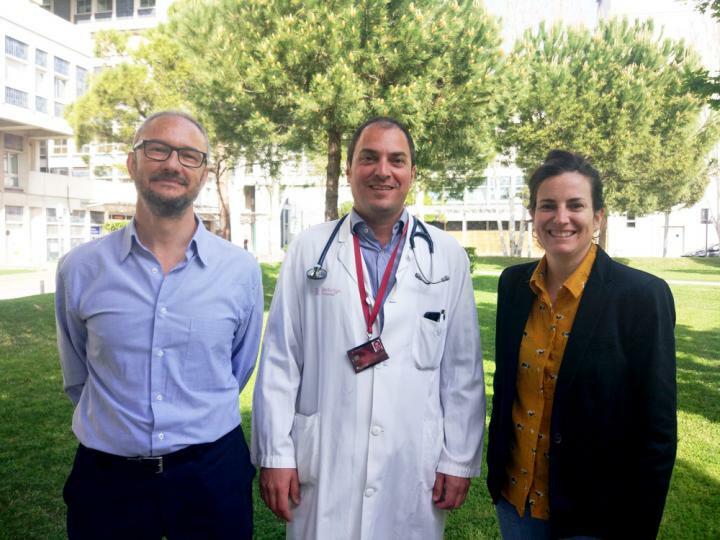 At the same time, Dr. Graupera's research on arteriovenous malformations put her in touch with Dr. Antoni Riera-Mestre, from the Internal Medicine Service and Coordinator of the HTT Unit of the Bellvitge University Hospital. This Unit receives patients from all over Catalonia and has so far treated 270 patients. Riera-Mestre is also the Coordinator of the RiTHHa registry (computerized registry of the HHT) that includes clinicians who treat patients with HHT throughout Spain. The collaboration between Viñals, Graupera and Riera-Mestre led to the association between the BMP9 mutation and the PI3K lack of control in patient samples, confirming the results observed in animal models. "Now, the next step is clear: we have to assess the effects of PI3K inhibitors in patients", Viñals states. "PI3K inhibitors are currently used in the treatment of patients with cancer or patients who require immunosuppression after organ transplantation, and it has been observed that in patients with these pathologies and HHT, treatment results in a reduction of the issues caused by HHT, which is a very encouraging fact". Dr. Riera-Mestre's team plans to follow this research path in the coming years. On the other hand, HHT caused by mutations of ALK1 represents only 35-40% of the total. Researchers want to "test samples of patients with other mutations associated with this disease, or without an identified mutation, to find out if PI3K is the common denominator among these diseases, which can help us identify new affected genes or establish new treatments". This line of research has received a FIS 2018 grant, which will strengthen the interaction between basic and clinical researchers at Bellvitge.